After several recent attempts, Riverside officials have now scrapped expensive plans to construct a new downtown library in favor of a more modest renovation of the existing building. We realize this new directive from the city council may not serve all interests and parties involved, and we do agree a modest renovation/refurbishment is warranted. However, we also admit we're glad to see the focus back to renovation and reuse versus complete demolition. Why? 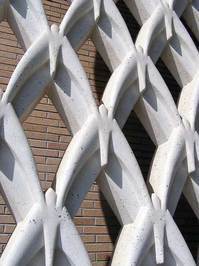 First and foremost, it allows for potential preservation of the building (and most/all of its architectural features). Second, a renovation plan is much less costly (and more likely to get funded/completed). Definitely one of Riverside's best mid-century buildings -- and certainly its most under-appreciated -- construction of the downtown Main Library (a.k.a. 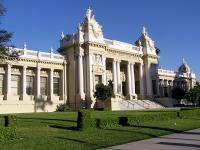 Central Library) was approved by voters following a $1.7 million bond measure in October 1961. After several months of controversy over the location and size of parking lots around the new building, ground was formally broken on June 25, 1963. However, as a prime example of the New Formalism architectural movement, which was popular for public, institutional and financial buildings during the 1960s, the downtown library includes several hallmarks of this mid-century style: rigid box-like appearance, floating pedestal, brick veneer, strong pilasters, large overhang, fanciful canopy and period lighting (one | two | three). Finally, we also realize the downtown library's bold and futuristic architecture stands in stark contrast to its neighbors, the most notable being the nearby Mission Inn. The two buildings are from vastly different eras and indeed are distinctly different. However, we feel it's this very juxtaposition that actually makes both buildings more unique in their own right, bringing out both the best and worst features of each (as good organic architecture should). All in all, we believe the 1965-era library is one of the best examples of mid-century modern architecture in the Inland region (and maybe even Southern California). And we believe it's worth enhancing and preserving. What do you think? Two weeks back, we featured an item on the recent unveiling of a downtown statue honoring Riverside citrus pioneer Eliza L. Tibbets. In the early 1870s, Eliza secured two small navel orange trees from the U.S. Department of Agriculture for test planting in Riverside. Originating as a mutation in Bahia, Brazil, these navel trees took well to Riverside's semi-arid climate, producing a sweet, succulent and seedless navel orange. California -- and in particular, Inland Southern California -- would never be the same. The unveiling of the statue prompted us to dig through our image bank for photos associated with Riverside's citrus legacy. Of course, it also forced us to go out and take some new photos for items we didn't already have (and update some we did). 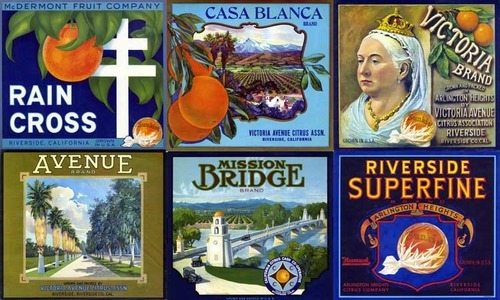 Though certainly not a complete collection of images related to Riverside's citrus past (nor does it include images from other local citrus-rich communities, namely Redlands, Corona and Upland), we feel the gallery still manages to show the wide-reaching importance the navel orange played in shaping both Riverside's landscape and its history -- a history that was dramatically changed with the arrival of two seemingly inconspicuous navel orange trees in 1873. 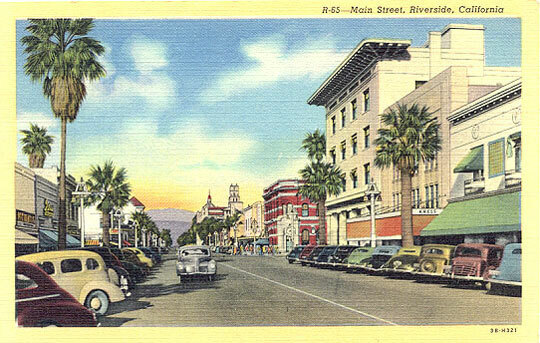 We thought we'd start the new year off with an old postcard showing a few of downtown Riverside's civic buildings. 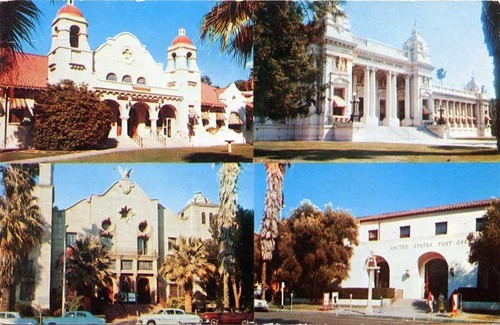 Dating from the late 1950s / early 1960s, the images show the 1903 Carnegie Library, the 1903 Riverside County Courthouse, the 1927 Municipal Auditorium, and the 1939 U.S. Post Office. Three of the four buildings remain standing today (the Carnegie Library met the wrecking ball in 1964). 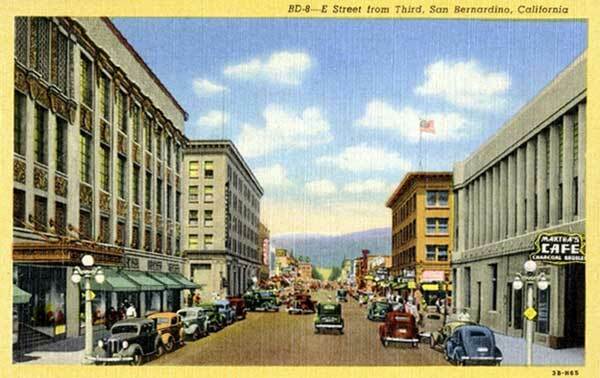 At least one of the photos (and maybe all) were taken by Max Mahon, whose images of downtown Riverside from that era have been used on several postcards distributed by Columbia Wholesale Supply. Glad to hear you (have?) (gone?) into the house. Weather out here is nice and cool but no 12 (degrees) below thank goodness. Hope you are feeling fine and have a nice Christmas. In the coming year, we're planning to continue our efforts at spotlighting Riverside's history, with more postcards, images and tidbits from the past. In particular, we're hoping to gather more from the post-World War II era of Riverside (which are surprisingly difficult to track down). So if you have suggestions -- and even better, images -- be sure to send them to us! 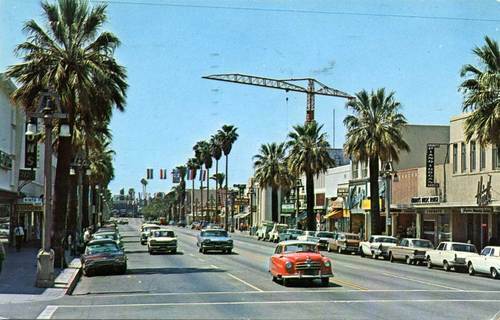 As mentioned before, Eighth Street -- now University Avenue -- in Riverside's eastside was once the city's "motel row." In many ways, with several motels, hotels and eateries remaining, it still serves that purpose today. One of the earliest major chain motels to pop up on the stretch between downtown and UC Riverside was the Riverside TraveLodge. Located at 1911 Eighth Street (University Avenue), city permits indicate the motel likely opened in late 1951 or early 1952. Aerial photos from 1948 confirm the hotel was not present. Riverside's Newest and Finest Close In Motor Hotel. 24 De-Luxe units. Beauty-rest beds, tile baths, wall-to-wall carpets. Riverside's largest and finest close-in motor hotel. Heated pool, radio, TV and phone in rooms. Wall to wall carpeting. Tiled showers with Hollywood glass doors -- Beauty Rest beds -- refrigerated air -- kitchenettes. AAA approved. Today, the former TraveLodge is known as the Budget Inn. We're not sure when the TraveLodge name was removed from the motel, but seem to recall it lasting into the early 1990s. However, a 1993 chamber publication lists the hotel simply as Riverside Motel while a 1996 permit to demo the pool (1965 | 2010) was issued under the current Budget Inn nameplate. 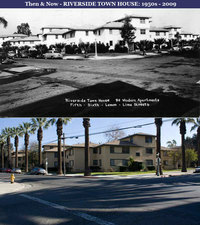 University Avenue: Riverside's "motel row"
Prior to the building of the 60 Freeway through Riverside in the early 1960s, the main highway heading into downtown from the east was Eighth Street. Visitors traveling between Palm Springs and Los Angeles could grab some rest at any one of the half-dozen or so small, roadside motels scattered along a two-mile stretch between UC Riverside and downtown. As such, Eighth Street -- now University Avenue -- became the city's "motel row." With its proximity to the city's early industrial areas, UC Riverside, March AFB and the now defunct Riverside International Raceway, the accumulation of motels, hotels and restaurants grew considerably during the 1960s and 1970s as national chains the likes of Ramada Inn and Holiday Inn began popping up. And by the 1990s, larger hotels, such as Days Inn (now Courtyard by Marriott), had sprung up as well. However, as in many cities across the nation, when the newer and larger hotels arrived, the smaller motels began decaying, eventually leading to seedier surroundings. Likewise, the 1987 opening of downtown's 12-story Sheraton (now Marriott), the closing of Riverside International Raceway in 1989 and the 1993 reopening of downtown's historic Mission Inn dealt a tough blow to even the larger hotels. 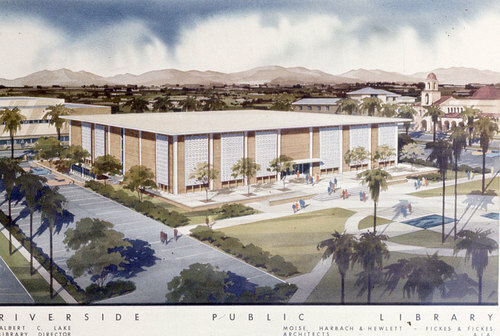 By the mid-1990s, control of the former Ramada and Holiday inns would be assumed by UC Riverside, which uses the adjacent properties for offices, classrooms and exchange student housing. 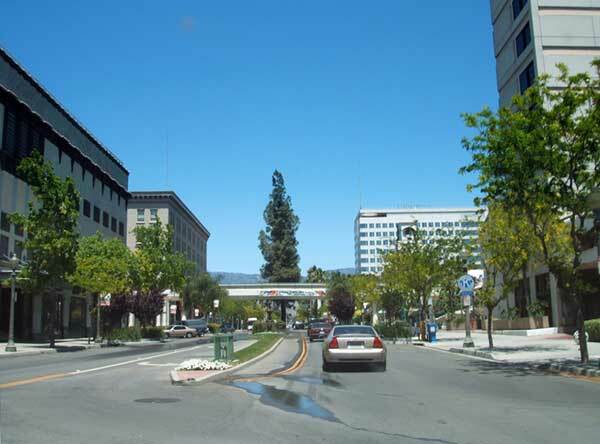 Since 2000, however, Riverside has invested millions of dollars in implementing the University Avenue specific plan that included refurbishing and/or phasing out the older, seedier motels and adding landscaping to the curb and street medians. More recently, several of the decaying motels have been demolished. A large, mixed-use apartment complex for UCR students replaced one, a retail center replaced another, while a few others have become empty lots awaiting redevelopment. Over the ensuing months, we hope to spotlight a few of these motels and hotels and maybe even a couple of the eateries, some of which no longer exist. For now, below are a few photos from the three mid-century neon signs that remain from "motel row's" past. 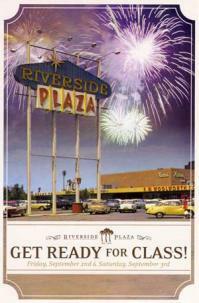 This October will mark the 40th anniversary of the Tyler Mall in Riverside. Previously, we did an overview of how the mall came into existence and how it came to be as it's known today -- Galleria at Tyler. 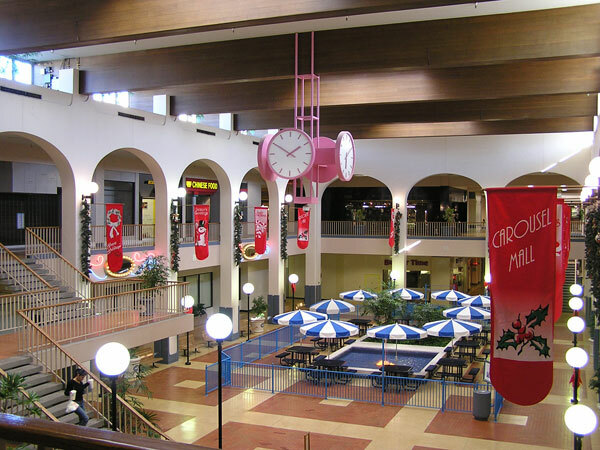 In the coming months, we'll add a few more posts about various aspects of the mall. 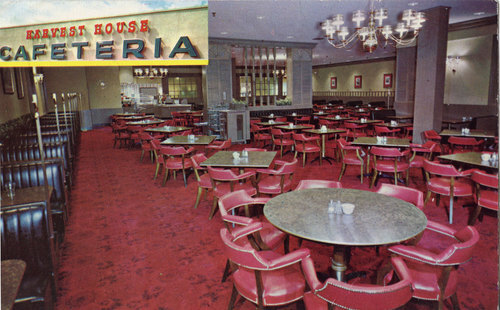 For now, we begin with one of the few postcards we can find associated with the mall itself -- Harvest House cafeteria. ... in 1954, (F.W. Woolworth) began setting up its own chain of cafeterias and restaurants, named Harvest House. Located near, usually adjoining, Woolworth stores, the new Harvest House restaurants, with their cornucopia insignia, were not intended to take the place of the in-house lunch counters and soda fountains, but to supply more leisurely settings for customer dining." The Tyler Mall Harvest House opened with the mall in October 1970. It was situated on the mall's southeastern side halfway between anchors JCPenney and May Co. (though May Co. would not open until 1973). Immediately adjacent to Harvest House was a 61,000 sq. ft., 2-story Woolworth's (today, the former Woolworth's basement serves as a Tuesday Morning outlet). According to a Press-Enterprise article on the mall's grand opening, the general manager of the new Woolworth's was Larry G. Shappart while the manager for Harvest House was Francis A. Costanzo. 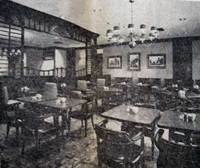 One variation of Harvest House's "Colonial" theme (as seen in the postcard above) gave the cafeteria style restaurant a down-home "Americana" feel. But the wood brown paneling with red carpet and green-hued walls also made it feel dated and dreary (at least to us kids). And when the dining room was near empty, as it often seemed at the Tyler Mall location, it felt more like a mausoleum than a restaurant. Only the occasional kitchen noise and faint sounds of shopping activity drifting in through the entrance from Woolworth's would break the eerie silence. Once past the semi-formal entryway, patrons encountered a long narrow hallway -- separated from the dining area -- leading back to the cafeteria service. (Again, as a kid, this is where the trepidation, wondering what kind of awful food is actually served here, would begin -- assuming you hadn't already begged your parents to go to McDonald's instead). 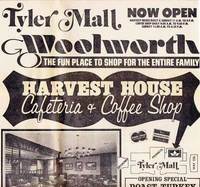 By 1976, there were 50 Harvest House cafeterias in existence, with even more lunch counters/cafes still in operation inside many Woolworth's (including, at one time, a small cafe attached to the Tyler Mall store). Surprisingly, Harvest House lasted well into the 1980s, with the last one closing in the mid-1990s (we seem to recall the Tyler Mall HH had closed by 1990). Woolworth's itself would succumb in 1997, though the parent company lives on in the form of its most successful division -- Foot Locker. Earlier this month, the 102-year-old Seth Thomas pedestal clock, which was damaged last year during the refurbishing of the pedestrian mall, made its way back to downtown Riverside. 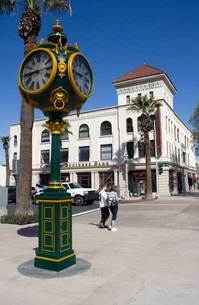 Though the clock itself dates back to 1908, it didn't appear in Riverside until the 1920s when it was planted outside a jeweler's store on Main Street. The clock's current location near the corner of Main Street and Mission Inn Avenue (near Coffee Bean & Tea Leaf), sits across the mall and about a half-block north from its previous spot near the former Westbrook's/Imperial Hardware building. We're not certain when the clock was placed in front of Westbrook's. Some say it was moved there from its original spot elsewhere on Main Street. But a postcard from the 1940s indicates it had been in front of Westbrook's for several decades before being damaged last year by a contractor -- who paid for the repair -- and eventually moving to its current location near Mission Inn Avenue. Interestingly, based upon old photos, it appears the clock had also been moved several feet toward University Avenue and placed a bit closer to the center of the pedestrian mall at some point while located near Westbrook's. 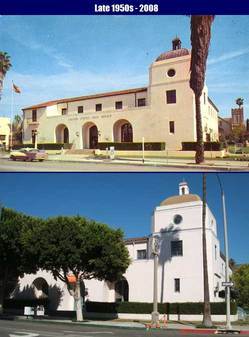 Over the past 96 years, downtown Riverside has seen 2 main post offices built, the first in 1912 and the second in 1939. 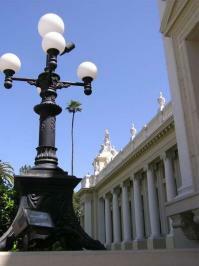 First came the 1912 Federal Building located on Seventh Street (Mission Inn Avenue). Sporting Italian-Renaissance architecture, the building served as the city's main post office for nearly 30 years. Afterward, the building became the headquarters for the 4th Air Force during World War II. 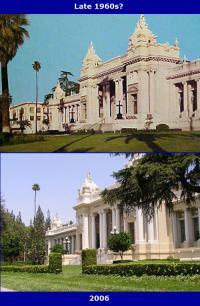 Later uses included housing the city's police department*, and currently, the Riverside Metropolitan Museum. The second downtown post office, located a few blocks away on the northeast corner of Ninth and Orange streets, came online just as World War II was beginning. Built at a cost of $175,900, this later version sports Spanish-Mission architecture with Art Deco/Moderne-influenced designs inside. Seen in photos approximately 50 years apart, this second post office remains an architectural gem in downtown today. Note in the 1950s photo the lack of trees but a hedge which still remains today. Note also that Orange Street is a two-way street as opposed to today's one-way between University Avenue and Fourteenth Street. Finally, visible in the far right background of the earlier photo is the First Baptist Church. Located at the northeast corner of Ninth and Lemon, the church site today is home to a 5-story building constructed in the late 1980s. We're not certain of the exact year, but this postcard appears to be sometime during the 1950s. 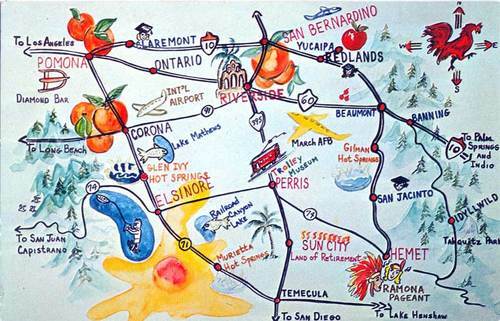 Based upon "Int'l Airport" being used for notating Ontario Airport, it's likely post-1946 -- the year Ontario Municipal Airport was re-named Ontario International Airport. Likewise, the lack of Lake Perris means it's pre-1974. Note also the current-day routes for the I-15 and I-215 freeways are signed as 71 and 395 respectively and the 60 Freeway between Riverside and Pomona appears to follow the old Mission Blvd. route, which again, likely dates the card to the 1950s. At any rate, the postcard hails from a time when Inland Southern California was better known for its orange groves and outdoor recreation rather than for explosive, suburban growth. One of the things we find fascinating are how places and/or buildings change -- or don't change -- over time. Sometimes it's a simple paint job on an old house or building while at other times an entire building -- or entire block -- is completely redeveloped. Sometimes the transformation takes several years, while in other cases the landscape changes rather quickly. 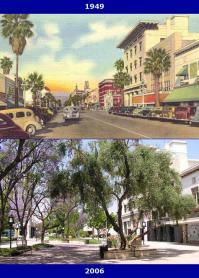 Click the image below for two views of "E" Street in downtown San Bernardino, first from the 1940s and next from 2007. 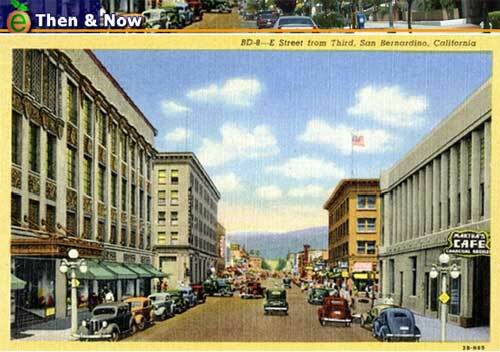 Both views are looking north toward the intersection with 3rd Street (note: the 1940s postcard incorrectly states the view as being from 3rd Street as opposed to being toward 3rd Street). On the immediate left is the Harris Co. department store, with its decorative elements, while just beyond it is the Andresen Building, which was the former home to Bank of America. As seen in the 2007 view, both structures remain standing today, though the Harris Co. building is currently closed. On the right, the scene has changed dramatically. Civic Plaza -- which encompasses City Hall, Exhibit Hall and the Clarion Hotel -- has replaced the buildings on the immediate right, including the one-time branch of Citizens' National Bank (foreground) and the four-story, 1890 Katz Building (background). With the redevelopment of Carousel Mall -- of which the Harris Co. building anchors its eastern end -- becoming much more probable, the immediate area is likely to change dramatically once again. 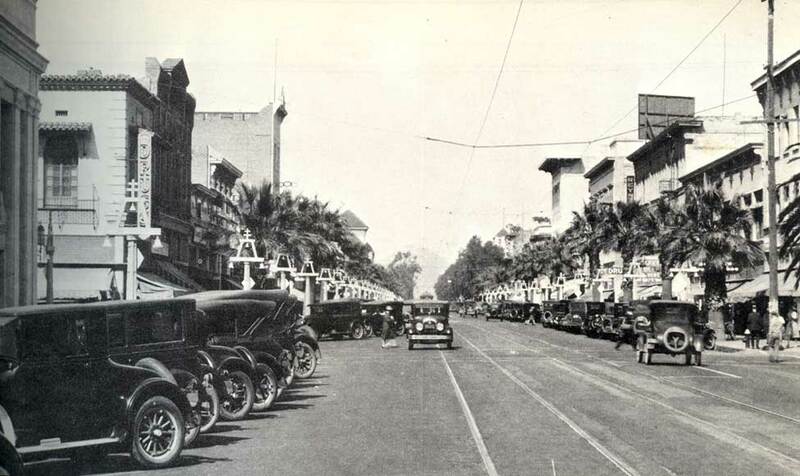 Before there was a Main Street Pedestrian Mall in downtown Riverside there was, well, an actual Main Street, with actual cars -- and curbside parking. In late 1965, the city settled upon an initial plan and work began in May of 1966 at tearing out Main Street between Sixth and Tenth streets. On November 23, 1966, the mall was officially dedicated* and open for business. However, with its opening coinciding with America's growing appetite for suburban shopping centers, the pedestrian mall got off to a rocky start. 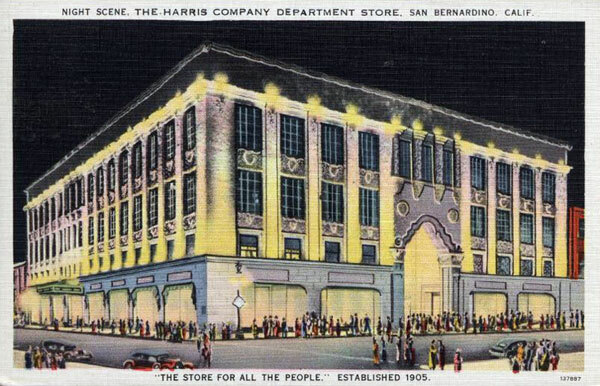 One major retailer (Sears*) had already relocated to a larger new store elsewhere in Riverside while two others (Montgomery Ward, JC Penney) would eventually follow suit. The flight of retail only got worse with the 1970 opening of Riverside's Tyler Mall** (now Galleria at Tyler), which was double the size of the earlier Riverside Plaza and -- more importantly at the time -- it was enclosed. Although the loss of the major retailers was significant, the pedestrian mall's plight began stabilizing in the mid-1970s with the opening of the new city hall and convention center (anchoring opposite ends of the mall) as well as an 11-story Security Pacific National Bank building (seen here in 1976**: one | two), which replaced aging storefronts near the mall's center. But America's love affair with large enclosed shopping centers -- and free easy parking -- continued to erode the downtown retail market. By the early 1980s, storefronts along the pedestrian mall consisted mostly of small local shops and empty spaces. The slow decline of the Mission Inn, which had transformed from an opulent hotel into rental/student apartments, certainly did not help. For a while, it appeared the mall's future was in doubt. One bright spot development-wise during this period was the 6-story Mission Square building, which in 1984 replaced another block of mostly empty and aging storefronts between Ninth and University. 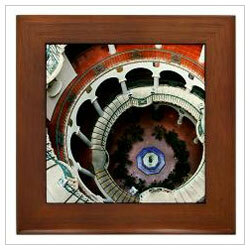 In 1988, however, things began looking up as a refurbished Mission Inn hotel was set to reopen. Renovated over 3 years to the tune of $30 million (which would eventually approach $50 million), the newly christened Omni Mission Inn** was seen by civic officials as an important catalyst for reviving the floundering pedestrian mall. Yet just weeks before its official grand opening, the Inn's owner -- Carley Capital Group -- went bankrupt, forcing a takeover of the Inn by Chemical Bank of New York. The bankruptcy dealt a serious blow to both the mall and downtown in general. Moreover, it would be another 4 years before the Inn fully reopened. Another significant event was the 1992 merger of Security Pacific National Bank into Bank of America, which saw the mall lose one of its primary anchors. Subsequent plans for re-using the bank's 11-story building included an option of reopening parts of the pedestrian mall to limited traffic. Fortunately, a second event later that year -- the purchase and reopening of the Mission Inn by local businessman Duane Roberts -- helped keep the pedestrian mall intact and free of cars. 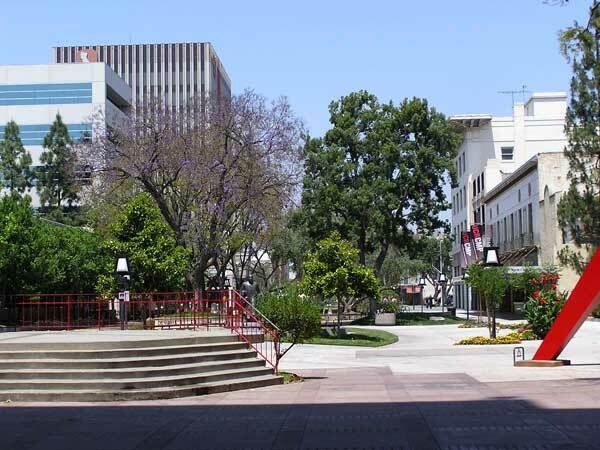 Today, the downtown pedestrian mall stretches upwards of 7 blocks from Tenth to Third streets and remains one of Southern California's only true pedestrian plazas. Although it has taken 40 years to arrive at where it is today -- and indeed, a few rough spots remain -- thankfully, most residents simply could not imagine it reverting back to just another traffic-clogged street. In fact, the pedestrian mall is about to undergo a face-lift -- its first major rehab since being built in 1966. Since the December 1992 reopening of the Mission Inn, the pedestrian mall has steadily picked up steam. 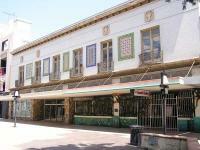 The former Security Pacific Bank building has become a collection of offices mostly for the state of California while small independant shops throughout the mall coexist alongside a mixture of banks, eateries, service-related businesses and cultural arts establishments. Recently, the mall has seen an influx of higher-end establishments such as Renuance Aesthetic Care and eateries Trilussa, Omakase and Coffee Bean & Tea Leaf. The most surprising empty spot remains the long-shuttered Imperial Hardware building, which in a strange twist has actually added a bit of flavor to the mall on account of its colorful art and mid-century facade, both seemingly frozen in time. The one item still missing is a national retailer or major bookstore, which is likely to change within the next few years as the city's plans for 500-plus condos and lofts begin taking shape (see: m' sole and Fox Plaza). Our hope is that any potential influx of national chains, which could greatly increase out-of-area foot traffic, does so not at the expense of too many of the unique local shops -- a few of which have survived a number of lean years. 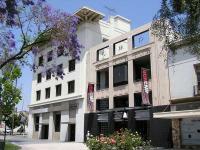 Indeed, the recent surge in activity, the upcoming face-lift, the soon-to-be Culver Center for the Arts and the planned residential/office development nearby promises to solidify the mall as downtown's cultural and civic plaza. Without a doubt, the pedestrian mall is a unique gem that Riverside is fortunate to have. RIVERSIDE, CALIFORNIA - Seventh Street near Orange. This is a city typical of California at its best. Its tree-lined streets, Mission architecture, groves of fragrant orange trees and its atmosphere of hospitality never fail to impress the visitor. Considered one of the finest examples of Beaux Arts Classical architecture in the nation, the Riverside County Courthouse is a gem among civic buildings. 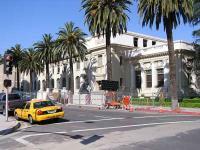 Designed by the architectural firm of Burnham and Bliesner of Los Angeles, the 1903 courthouse is patterned after the "Grand Palais" (Grand Palace) and "Petit Palais" (Little Palace) both from the 1900 Universal Exposition (World's Fair) in Paris. The courthouse, which originally cost a mere $160,280 to construct, was rededicated October 5, 1998 following a 3-year, $25 million renovation and seismic upgrade. The picturesque courthouse was the indirect result of an intra-county tax dispute. 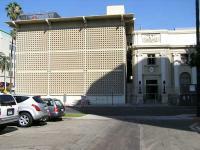 San Bernardino County -- of which at the time included present-day Riverside -- voted to raise taxes to fund expansion of the existing county courthouse located in downtown San Bernardino. However, this new tax was not taken lightly in Riverside, wherein higher property values equated to a higher share of the overall courthouse tax. Compounded by other similar issues, this new tax spurred Riverside officials to expedite proceedings that eventually led to the May 2, 1893 establishment of Riverside County. Of course, Riverside now needed to fund and build its own county courthouse. Fortunately, the city's continuing rise in wealth made such funding much easier. In fact, by 1895 -- just 2 years following the establishment of the new county -- the City of Riverside was the richest city per capita in the United States. As such, the city soon began the process of commissioning new civic buildings -- including the courthouse -- that reflected the city's new wealth and stature. However, had the city and county gone the expected route of building a Mission Revival-styled courthouse (as backed by influential Mission Inn owner Frank Milller), the elegant courthouse we see today may not have been. Instead, county supervisors were eventually persuaded in favor of a French-inspired, Beaux-Arts design. Without a doubt, the significance of that decision could not be more important today as the unique courthouse stands out among civic buildings. In 1930, a major expansion to the courthouse by local architect G. Stanley Wilson increased courtrooms on the back, or eastern elevation (Orange St.). Designed to mimic the original Beaux-Arts motif, the expansion fits in well against the original design. However, a bulky and spartan post-war addition to the southeastern elevation (Orange/Eleventh streets), though unique in its own way, stands out in stark contrast against the magnificently detailed facades of both the original and expansion. Regardless, thanks to the foresight of county supervisors in 1995, the grand courthouse will stand for generations to come, reminding residents and visitors alike of both the wealth and vision of the city's residents during the formative years. One of the things that most facinates us are how places and/or buildings change -- or don't change -- over time. Sometimes it's a simple paint job on an old house or building while at other times an entire building -- or entire block -- is completely redeveloped. Such is the natural evolution of cities. With that said, one of our favorite sections of this site is the "Then & Now" feature. A simple exercise in comparing and constrasting the same building, street or block from one time period to another. Maybe it's a 100-year-old photo or 50-year-old postcard, or simply a few years of passage. Whatever the timespan, it's interesting to see how much -- or how little -- things have changed from one era to another. 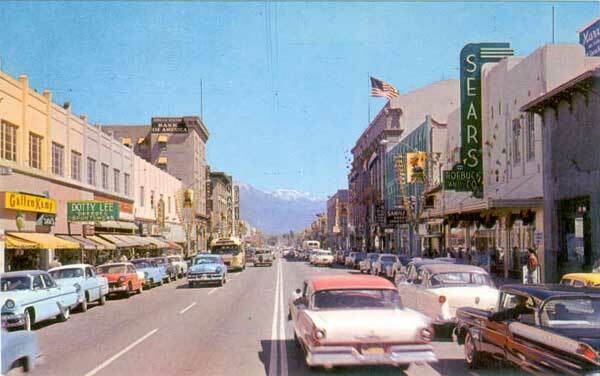 First up, is a view looking north on Main Street at Ninth Street from 1949. Immediately on the right is Rouse's Department Store (green canopy) followed by the Kress Building (partially covered by palm tree). Standing tall is the 1911 First National Bank building. 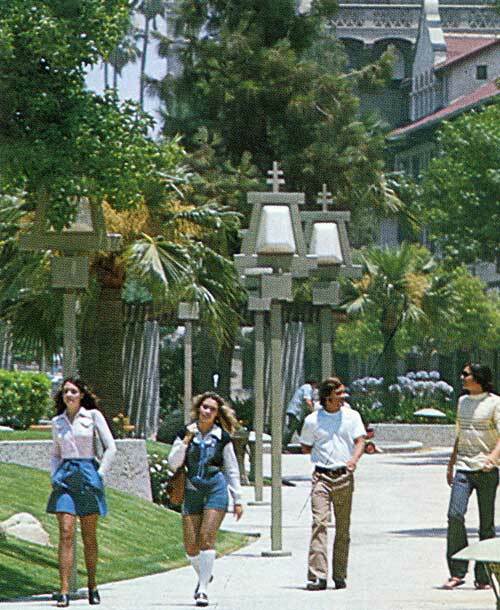 Beyond these is the now-gone Evans Building (red brick) and in the distance are two towers of the Mission Inn. Visible on the left is the top of the still-standing Loring Building (red, triangular-shaped roof) located at the corner of Seventh Street (Mission Inn Avenue) and Main Street. 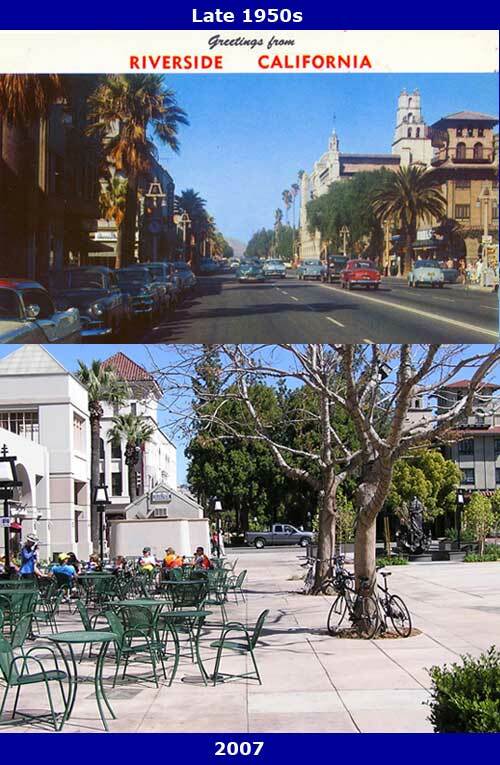 The exact same view from 2006 shows that, first and foremost, Main Street has been removed, or rather, turned into the Main Street Pedestrian Mall (1966). 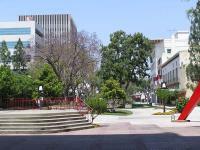 Although the Rouse (UCR/Culver Arts Center), Kress (UCR/CMP) and First National Bank buildings remain standing on the right, all the buildings on the left have since been replaced by office buildings (partially hidden). Of course, foilage now also blocks the view of the two Mission Inn towers. However, peeking out between the trees on the lower left is the triangular-shaped roof of the Loring Building. Lastly, directly behind the camera sits City Hall (1975), which was built to anchor the south end of the pedestrian mall. Can a reborn shopping center inject new life into an older suburban neighborhood? Indeed it can as witnessed with the recently rebuilt Riverside Plaza. 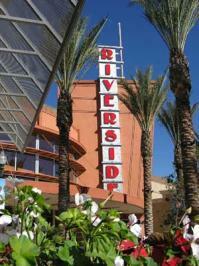 Opened in three stages in 1956-57 as an outdoor shopping plaza and enclosed during a 1984 renovation, Riverside's first mall-like center has now come full-circle with its rebirth as an outdoor plaza once again. As part of the rebuild, an assortment of new shops and eateries have planted roots with still more to come in a second phase currently under construction ("The Orchard Shops"). The only portion left from previous incarnations is the 1957 Harris-Gottschalks department store, itself receiving a complete makeover. Also new to the mix is the addition of a Borders Books & Music and a 16-screen Regal Cinemas, which combined with the main street-like atmosphere and new eateries -- including California Pizza Kitchen, Ooka Japanese Restaurant, Citrus City Grille -- makes the new Plaza much more of a dining and entertainment destination than before. Oh, and we can't forget about the relocated Trader Joe's, which in reality is only about 25 yards from where it previously stood. Likewise, adding extra life is the regularly-held events involving local schools and community organizations as well as "holiday flavoring" with a bit of fireworks during Fourth of July and a dash of snow during Christmastime. More importantly, however, is that with the revival has come a renewed sense of place and reinvigoration within the surrounding Magnolia Center neighborhood, as highlighted in a recent article in the Los Angeles Times: Plaza revival breathes new life into Magnolia Center.